WE recently ran into a colleague we worked with many, many moons ago at ABC News, returning to her now-home on the Isle of Pines after a week cruising the mighty Mekong aboard the replica colonial river steamer, Indochina Pandaw. WE rode in ox carts and 'cyclos,' visited cat-fish farms and floating markets, sampled snake wine and exotic fruits, caught a rare, lithesome gibbon swinging from rafters above our heads, held hands with and gave school books to village children who tugged at our heart strings, all the while gently cruising down the Mekong. No television, radio, piped music or internet, just the swirl of the mighty river, its banks sometimes close enough to touch, sometimes a kilometre apart, a 4,000 kilometre artery feeding, watering and housing millions along its route through South-East Asia from Tibet. Not the sort who enjoy organised tours, we'd been enticed by an article torn from a magazine a few years back and put with the proverbial 'bucket list.' Or was it purely the photo of the ship? A replica of wooden craft the British once used to ply the Irrawaddy in the 19th and first part of the 20th centuries. An olde-worlde vessel, only three decks above water level, thirty passenger cabins – the whole outfitted in teak and brass. Run by Pandaw Cruises, she was more like home from the moment we stepped aboard. Our cabin cosy, easy to live in, wood panelling, white and navy blue linen, highlighted by the finer touches of fresh flowers and silk bathrobes. Such details were enhanced by the young crew, ever devoted to making our seven-day stay comfortable and memorable. 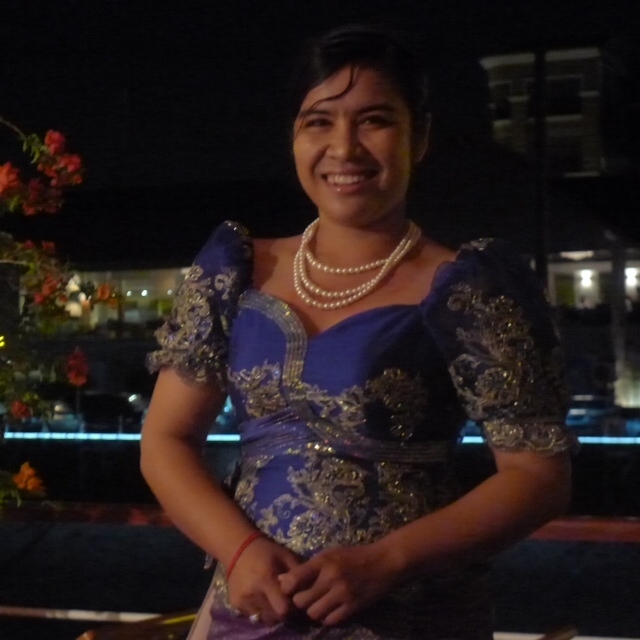 A mix of Cambodian, Vietnamese and Burmese, they reflected the vessel – discreet, attentive, innovative. Refined dining of a quality and variety to match the best anywhere, whether sampling Asian dishes or enjoying those appealing to Western palates. Intrepid excursions to explore markets and fields, temples and villages, often scrambling up the bank where the ship had drawn alongside, tying up to the nearest tree… guides brimming with history, facts and figures and their own personal accounts of growing up through recent tumultuous decades in Cambodia and Vietnam. While Indochina Pandaw can take 60 passengers, we were only 22, coddled by 26 crew. Early June is considered the low season, the water level just starting to rise. And it can rain every day, but we were lucky: only one afternoon did the wind whip up, the skies darken and the rain pelt down for an hour. The rest of the week it was warm and humid. Exploring was fun, but it was always with a welcome sigh we returned to the cool and respite of the ship. Our fellow voyagers were all widely travelled, mainly retired, but with the mental and physical verve of people interested in extending their experiences and horizons. The canopied sun deck bar and salon, and no set-seating for dining meant we made new acquaintances, swapped many a travel tale. All dressed simply yet correctly, with no pretentiousness. Interestingly all were Australian, except us: I'm a Kiwi, Albert is Swiss. And the pivot point, the person who made the cruise zing, who had an eye on everything from technical details to visas, from orphan children performing a magical concert with their own hand-made costumes, to a crew/guest farewell party the last evening, was Rosie – a Cambodian university graduate, officially the purser, but more like cruise director, confidante, coordinator for all aboard. Her vivacity and contagious laugh make her precious to Pandaw, and will echo with us for a long time to come. GOING aboard at Kampong Chhang in Cambodia. COLOURFUL markets like this one in Sa Dec, Vietnam abound. DUCKING up the river at Chau Doc in Vietnam. SKILLED art: making rice paper wrappings at Cai Be, Vietnam. 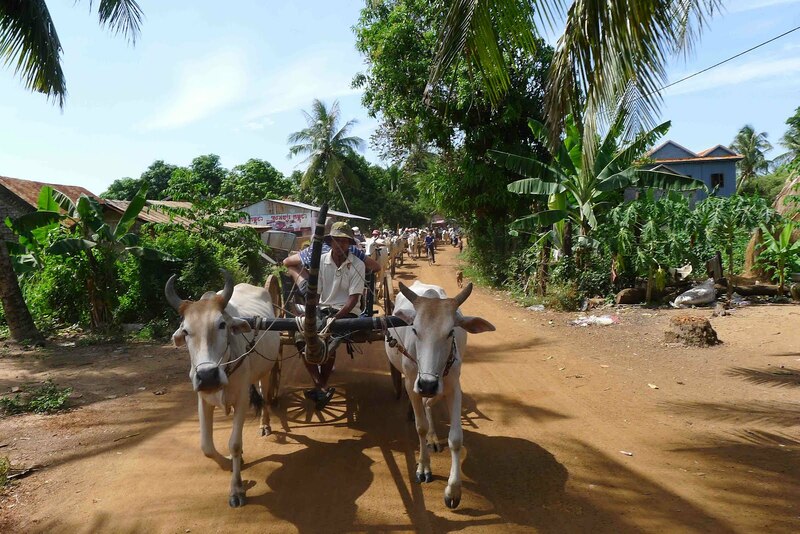 SHORE excursion by ox cart on the mighty Mekong. 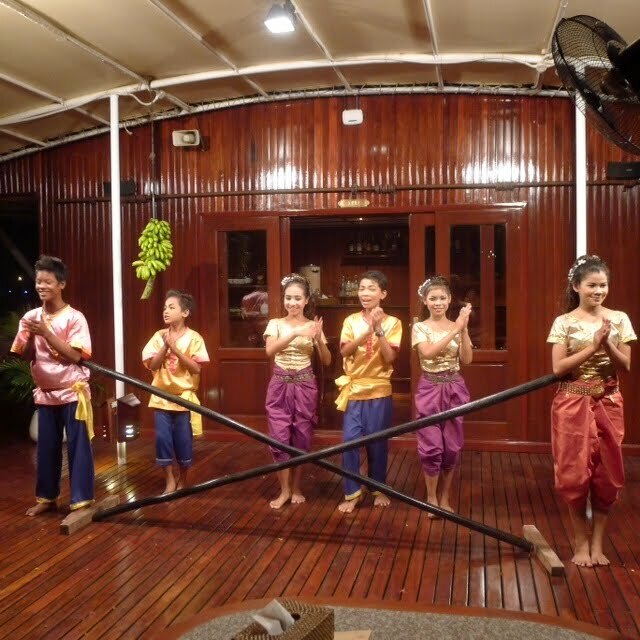 CHILDREN from an orphanage in Phom Penh give a performance aboard. ROSIE – a precious possession for Indochina Pandaw. INDOCHINA PANDAW on the Mekong.